The SNP's election triumph: Scots want nationalism but not a nation. 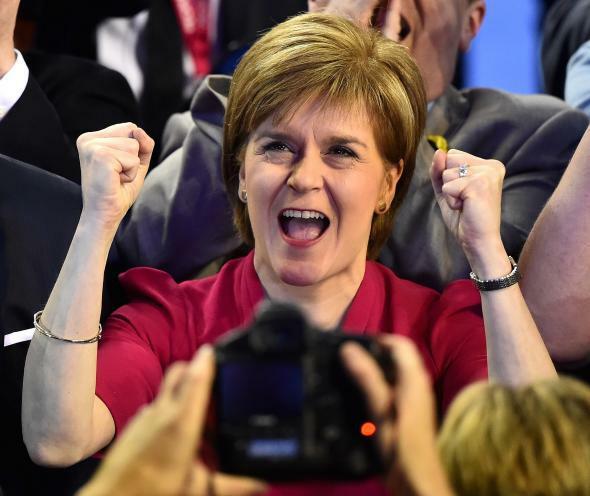 SNP leader Nicola Sturgeon celebrates in Glasgow on May 8, 2015. The one race that summed up the Labour Party’s terrible, horrible, no-good election night on Thursday may have been the constituency of Paisley and Renfrewshire South, where 20-year-old Scottish Nationalist Party candidate Mhairi Black, a university student who was nearly dropped from the party’s ticket for tweeting about her love of Smirnoff Ice and threatening to headbutt her opponents, defeated the Labour Party’s campaign chief and most likely candidate for foreign minister. Black will be the youngest member of Parliament since 1667. Other than David Cameron’s Conservatives confounding the polls to win an outright majority, the biggest story in last night’s British election was the SNP’s stunning success. The nationalists won 56 of the 59 parliamentary seats in Scotland, Labour’s traditional heartland, up from just six in 2010. It’s not fair to call the SNP spoilers—even if all their seats had gone to Labour, the Tories would still have a majority—but the SNP’s victory is still somewhat bittersweet as Cameron now has a mandate for cuts to social services, for bolstering the U.K.’s Scotland-based Trident nuclear deterrent, and for holding a referendum on whether Britain should exit the European Union, all policies staunchly opposed by the SNP’s left-wing base. In Britain’s winner-take-all electoral system, Cameron will have little incentive to compromise with the opposition. SNP leaders might also be wondering today where all this nationalist sentiment was last year, when all but four of Scotland’s council areas voted “no” in a referendum on whether Scotland should declare independence. Part of the difference may be Nicola Sturgeon, who replaced the similarly fishily named Alex Salmond as party leader after the referendum last year. She impressed viewers in televised debates, and is now by far Scotland’s most popular politician and possibly the most popular left-wing politician in the U.K. This result improves the prospect of Cameron agreeing to grant the Scottish parliament more power over its own budget and taxation. Today, Cameron promised Scotland the “strongest devolved government anywhere in the world with important powers over taxation.” Last night’s result could be seen as a vote for federalism over full independence. If the trend continues, it will mean quite a few more years in the wilderness for the beleaguered Labour Party.